Are you looking for managed WordPress hosting for your website(s)? Well, we have been doing some research on the best-managed WordPress hosting companies on the internet and found WP Engine. Take a look at what they have to offer and how you can move your site to WP Engine in less than 30 minutes. WP Engine provides best-in-class customer service on top of innovation-driven technology. This is why over 60,000 customers in 120 countries have chosen them for their mission critical WordPress hosting needs. [col-md-6] [/col-md-6] [col-md-6]With WP Engine’s new Speed Tool, you can find out just how much the speed, or lack thereof, of your WordPress site is costing you. Our speed tool examines how quickly parts of your site load and render. We use that data to recommend possible ways to improve your site’s speed and performance. 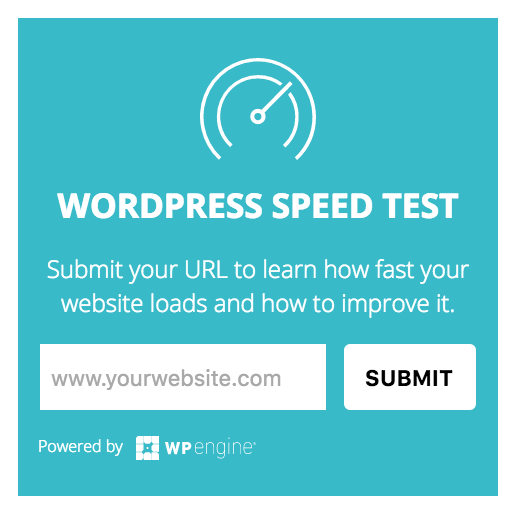 Use the image link to take your website for a speed test to see if making the switch could benefit your website or take a look at their plans. Currently, they have 5 plans ranging from $29 to $249 per month with an additional 2 plans made specifically for businesses. [col-md-9]If this sounds like a paid post, that is because it is. Typically, we do not do these types of post, but WPEngine offered a nice discount to our readers if we wrote about the services they offer. Don’t get me wrong, we hate paid posts…but we have used WP Engine before and it has huge advantages compared to other WordPress-specific hosting solutions. We would have recommended it even without the discount for our readers. Don’t take our word for it. Do your research about WP Engine and see how they can help your website. If you like them, great. If not, no hard feelings. We have worked with a multitude of hosting companies over the years and have opted for companies that meet our specific needs. For our typical hosting we have A2Hosting, but for more specific hosting platforms we use things like WP Engine. Find what suits your needs. With over a decade of experience designing and developing websites, Eric has worked in every position of the agency ladder. He is fluent in multiple backend and front end programming languages and has written multiple international best selling plugins for WordPress. He has been part of or is still part of many startups. He is the Director of Website Development for Future Design Group and one of it's founding partners.